The case for. – Dirty wet dog , boats and sailing. A cruising dinghy or similarly trailerable dayboat. My time in the lake district, Norfolk and then Essex-shire got me thinking about the value of a very small boat again and by which i mean several different types of small craft : canoe, sea kayak or sailing dinghy, even perhaps a multi-purpose small boat which i will explain later. I could be regarded as a reasonably competent cruising sailor of average boats, i do also have some degree of expertise with big sailing boats , i am also a decent canoeist (open canoe) and a less good sea-kayaker and mainly due to back problems. 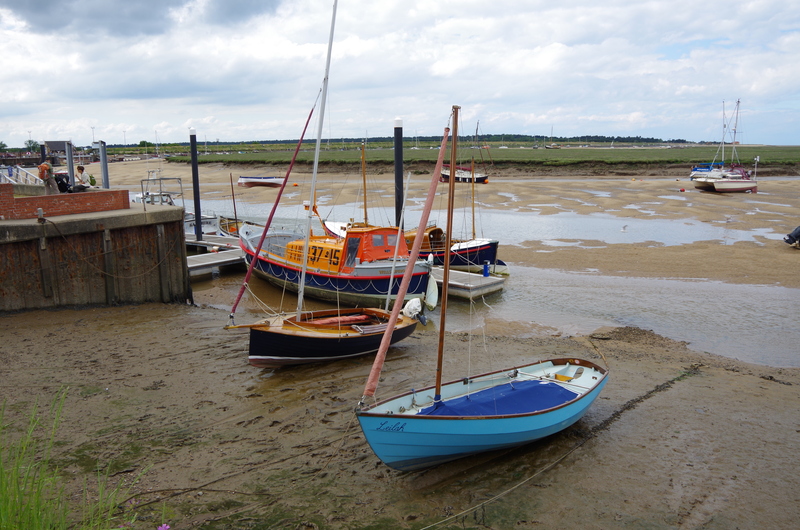 In both the lakes and Norfolk it would have been a whole lot of fun to have put either canoe or sea kayak in the water at Wells and explored the creeks all the way through to Blakeney for example as their does seem to be a viable route on the OS map. For the sea kayak i would try and get one of the excellent boats that we paddled in NZ called a ‘Sea-Bear Packhorse’….that’s a very wide boat intended for heavy and nervous charter-paddlers and is what most of the outfitters use , problem : there aren’t any in the UK. There are plenty of open canoes and the 2 of us are pretty slick in one of those so a fun project still might be to build a plywood lapstrake one and take that on our travels with us. Dinghy sailing though…..that’s something i have never done aside from a couple of sessions in an old Laser (far too quick and tippy) and one time a mate took me out in a ‘470’, i don’t remember too much about that. My partner had some lessons in a Wayfarer which is a good place to start and they of course are a well respected cruising dinghy which in the right hands can do awesome passages. There are a few others as well and so right now i am building up a potential list of contenders : in the title photograph there is a Devon Yawl which is a nice boat and one of the Drascombes , i don’t know which one and i don’t know much about them except that a lot of sailing schools use them as ‘safe’ teaching boats. The Drascombe i think of as the ‘MPV’ boat with an outboard on the back (must stop thinking of an outboard as a strap-on !) a rig and a set of oars to get me home. Never done it so it would be a good learning experience for an old seadog. I don’t know of any dinghy that i couldn’t get on a trailer and get home : even the big international 18 would do that and the Wayfarer/DY certainly as i have had a similar boat in the drive. Reduction of yard costs to zero…that would ‘clear the decks’ to have a boat project at the yard with less pressure to get it done. Set-up costs : there is a mark 1 Wayfarer on the market at £1500 with its trailer and the owner seems to have done lots of restoration work, equally there is a very nice looking Devon Yawl at just over £4 k. That’s do-able and both boats should have decent resale value if it didn’t work out. Running/kit costs : are obviously a lot less than kit for a cruising boat, i have for example a spare small anchor kicking around, both boats above might need a small strap-on which would only have to be a 2-horse job. Set of oars are cheap and we have lots of transferrable kit from our canoeing/kayaking. Car : my Pajero is probably in its last couple of years of active service without spending vast amounts on it , for a big trailer-sailer like the Dehler i would have to keep something like a Paj on the road, a dinghy on the other hand can be towed behind any decent car with a tow hitch. I am seriously chewing on this one as it would allow me to sail when and where i chose (with a bit of a drive) and yet have the boat at home and not costing anything to store. It would also clear the way to allow me to work on a larger project boat without the tearing hurry to get it done and get it sailing : my partner for example seemed to quite like the little Sadler, most of them are 35+ years old and would need an extensive refit which would be time intensive but less expensive on new kit than say a bigger boat such as the GK29. Peter Cash wrote : Imho you are really on the right track. We like a cuddy because of the cool spring and fall, also shade in the hot summers is a real plus. My 22′ beach cruiser has a cuddy and bimini so covers the bases( converted centerboard Star) Dislike o/b brackets so transon mount or a well is a must. Our V20 summers at a yard mast up ready to go. Just sold our wee seal mk2 so looking at cuddy Dovekie or Drascombe longboat cruiser/coaster. Lots of smaller 16’+ dinghys here but with cuddies that are only good for one. Which is fine by me as my bride likes her comforts. This has to be glass as it will sit on our dock/mooring for 5mths+ always ready for a daysail to the beach for a swim. So l get to play at home, at the yard, or on my dock. Fleet ownership has its benefits. Alan wrote : “Anything you can have at home is a bonus, as you know LB lives in the garage (built to fit, the garage that is !) one consideration with a tow vehicle is that it may be able to tow it but can you get up the launch ramp, the Mazda 626 wagon will tow the boat but I could never retrieve, as being front wheel drive there is no hope of getting up the ramp. A full boat cover works well on the maintenance reduction program. Means you can sail and build the Big boat ! Previous Weeks 5 and 6. Imho you are really on the right track. We like a cuddy because of the cool spring and fall, also shade in the hot summers is a real plus. My 22′ beach cruiser has a cuddy and bimini so covers the bases( converted centerboard Star) Dislike o/b brackets so transon mount or a well is a must. Our V20 summers at a yard mast up ready to go. Just sold our wee seal mk2 so looking at cuddy Dovekie or Drascombe longboat cruiser/coaster. Lots of smaller 16’+ dinghys here but with cuddies that are only good for one. Which is fine by me as my bride likes her comforts. This has to be glass as it will sit on our dock/mooring for 5mths+ always ready for a daysail to the beach for a swim. Anything you can have at home is a bonus, as you know LB lives in the garage (built to fit, the garage that is !) one consideration with a tow vehicle is that it may be able to tow it but can you get up the launch ramp, the Mazda 626 wagon will tow the boat but I could never retrieve, as being front wheel drive there is no hope of getting up the ramp.